Engineers and scientists are working hard to revolutionise the way patients take new and existing drugs. Many of the new drugs under development are ‘biologics’, which tend to be unsuitable for taking orally (as a pill) because the liver metabolises them. A classic example of a widely-used biologic drug is insulin for diabetes mellitus. Therefore injection is the most common way of taking biologics. Some of the biologic drugs, particularly monoclonal antibodies, require large masses to be injected. In order to inject a large drug mass, we have two choices: increase the injection volume, or increase the concentration of drug in the formulation. A long duration of injection, which can be uncomfortable and difficult to maintain injector position. It is extremely expensive to refit the aseptic filling lines that have been built for 1 mL syringes. Many drugs, especially those based on proteins, aggregate (stick together) above a certain concentration. These autoinjectors may be able to deliver viscous drugs, but still tend to be limited in injection volume due to the discomfort of injecting large volumes quickly and the difficulty in holding the autoinjector steady for long enough. The solution may be a different class of injection device: the bolus injector (sometimes called a ‘patch pump’, although this term is also used for ambulatory infusion pumps). A bolus injector is typically attached to the patient’s body for a few tens of seconds to a few hours, unlike an autoinjector which is held in the hand. Therefore a bolus injector may be able to deliver a larger volume than an autoinjector because it does not need to be manually held in position during injection, and could contain a larger drug reservoir. In addition, avoidance of a glass syringe may enable delivery of more viscous drugs. A bolus injector is normally designed to deliver its payload promptly, unlike an infusion pump in which the duration of delivery is a key parameter in the therapy (such as a constant, low flow rate, basal dose of insulin 24 hours per day). 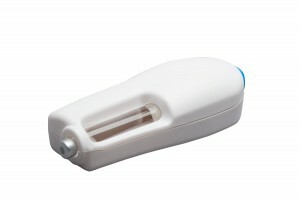 The bolus injector is only attached to the patient for the few minutes or hours that it is delivering its dose. 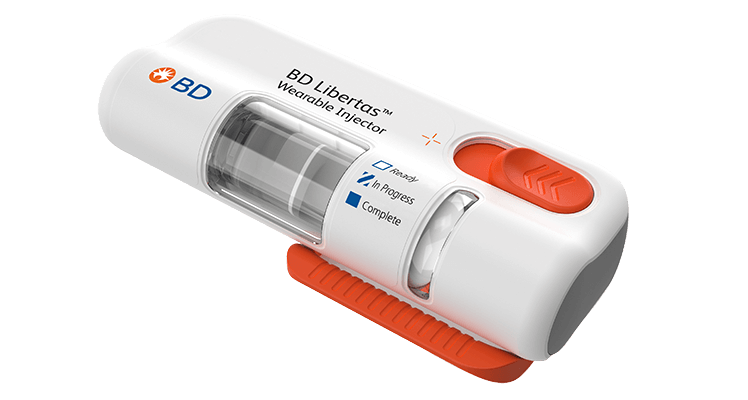 BD is developing the Libertas bolus injector built around a pre-filled BD Neopak syringe. 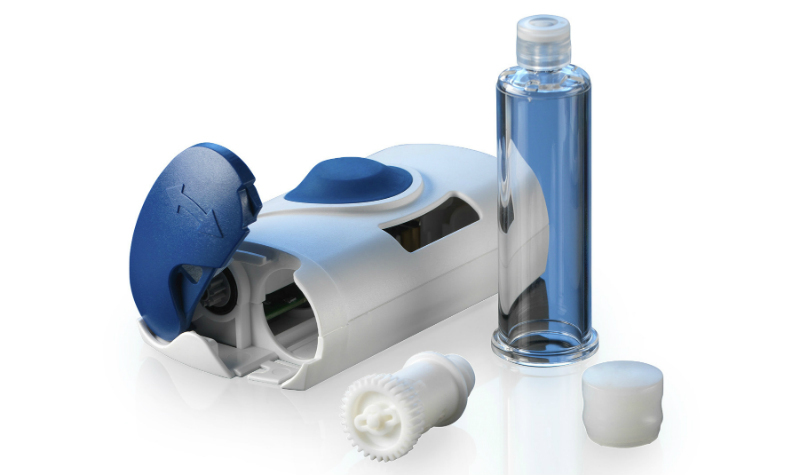 West has launched the Smart Dose injector for Amgen’s Repatha drug. The device is based on the Crystal Zenith plastic cartridge. 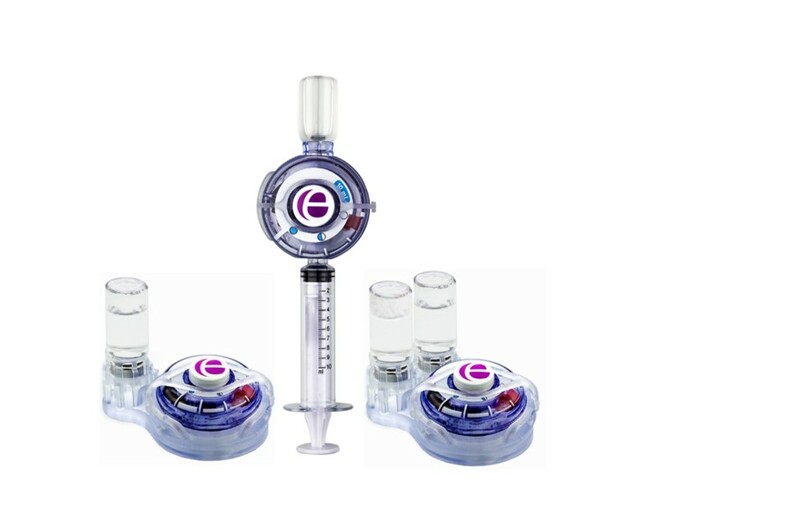 Enable Injections is working hard on its eponymous device, which takes a different approach to the prefilled devices above: the drug is supplied in a separate vial or syringe, then a filling pump fills the injector with the drug formulation shortly before attaching the injector to the body. This means that the device avoids some of the regulatory hurdle of proving drug stability for many months before use. 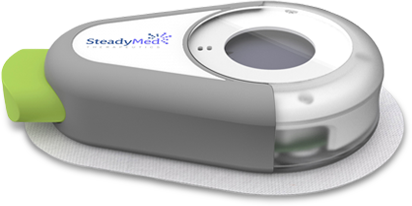 SteadyMed is developing the ‘PatchPump’ platform which uses an expanding battery to force drug out of a flexible primary drug container. 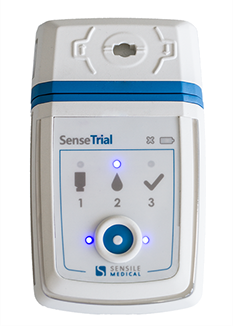 Sensile Medical has various formats of pump based around its core micropump technology. Ypsomed is promoting its YpsoDose concept based on 5 mL or 10 mL prefilled glass cartridges. Bespak has created a prototype demonstrator of a HFA gas-powered bolus injector, called Lapas. There are many other devices in development, such as the NeuroDerm continuous subcutaneous infusers. Others have been mothballed or cancelled, or otherwise fallen by the wayside such as the Roche Single Injection Device (formerly MyDose), Ratio Drug Delivery’s NuPrivo, and Unilife’s Precision Therapy. If your organisation is developing a bolus injector and you have recommendations for improving the list above, please get in touch. Many bolus injector designs use a novel primary pack, and pharmaceutical companies are very reluctant to risk their drug launch on new materials and designs. Device developers are trying to reduce the risk by using materials that have been used with drugs before. The second challenge is that a new primary drug container is likely to be incompatible with the pharmaceutical companies’ aseptic filling lines, which are extremely expensive and time-consuming to build and validate. In addition, some bolus injectors have advanced features such as automatic needle insertion and electronic control which increase development complexity. Finally, new devices must meet the newly raised regulatory demands on usability (human factors). The drug delivery device industry is working hard to define the requirements and test methods for acceptable bolus injectors, which is likely to become ISO 11608 part 6. We expect that bolus injectors will become a familiar part of the drug delivery device space, and that they could enable exciting new therapies such as regenerative medicine. If you would like to know more about bolus injectors, or have a need to procure or develop one, please get in touch. Springboard develops injection technologies, and conducts technology scouting, technology procurement, due diligence and usability engineering projects for our clients. Full disclosure: the author has worked on numerous injection device developments for pharmaceutical companies and device manufacturers, and has been asked to attend the meetings to draft ‘ISO 11608-6 Needle-based injection systems for medical use – Requirements and test methods – Part 6: Bolus Injectors’. This post was originally posted on 19 September 2013 and has been updated since. Springboard has been featured in a new article about the demand for top medical device developers.  As a leading technology consultancy, Springboard excels in the development of devices for safety-regulated industries such as medical devices. These span drug delivery devices, diagnostics, minimally-invasive surgical tools, wound care and more. See the full article at Business Weekly or, if you would like to get in touch now, call Tom Oakley on +44 (0) 1223 422 273. The latest innovations in wound care will be on show at the Wounds UK Annual Conference in Harrogate, 10 – 12 November 2014. Last year’s event had a several advanced technologies lurking between the traditional products. Diagnostics made an appearance, such as Woundchek’s protease test strip and a new partnership between Molnlycke Healthcare and Edinburgh University to identify infection risk. Perhaps we will see further steps towards patient-specific measurement of infection, performed rapidly at the point of case so that a personalised response can be delivered to that particular individual? There was also a great deal of activity by the newly funded NHS Health Technology Co-operatives, who were stepping up the effort to evaluate the performance of new technologies. Peter Vowden, clinical director of the Wound Prevention and Treatment co-operative said he wanted to improve the abilities of companies to target the most important issues with their new inventions. Several exhibitors spoke of their interest in following the evaluation programme, and so this year, with several technologies having completed the process, we should learn which ones were considered to be most valuable. It will also be interesting to see where the commercial direction is heading in future. KCI will have completed the first year following their merger with Systagenix, so perhaps there will be an indication of the direction the new combined company will be taking. And ConvaTec have announced they are seeking a buyer, so will no doubt be seeking to present those technologies which they feel will represent the most exciting opportunities for growth. Keith Turner of Springboard will be attending the event. As a company which develops new wound care technology for clients, we are always interested to speak to people about where the opportunities lie and how the latest advances in technology can be embraced to create business growth. Please get in contact via the form below to arrange a meeting at the conference. Larger doses with less frequent injections. The need for increased adherence, which may be addressed by electronic functionality in devices. If you work at a pharmaceutical company or medical device manufacturer and want to know more, please contact Tom Oakley. The recent SMi conference on Pre-Filled Syringes brought together experts from the pharmaceuticals, manufacturing and materials industries to reveal and discuss the latest innovations and market trends for the important Pre-Filled Syringe sector. The smart labelling presentation in particular showed some fascinating possibilities whereby labels could have RFID or NFC chips embedded, which can transmit information to a smartphone, for example redirecting it to a website. If you wish to find out more about the latest developments in Pre-Filled Syringes, please feel free to contact Tom Oakley on +44 1223 422 273. Where should innovation in Wound Care be focused in 2014? How can Wound Care technology companies grow their profits? Many of the answers to this question were on display recently at the annual Wounds UK conference in Harrogate. A great deal of the market sales volume is in standard products such as bordered foam dressings but, as every senior manager will be aware, it is difficult to grow a business with poorly differentiated products, especially when under intense cost pressure from suppliers in the emerging economies. This means innovation is required to solve a valuable need in a way that other competitors cannot match. Get yourself some Intellectual Property and you’re in a strong position. 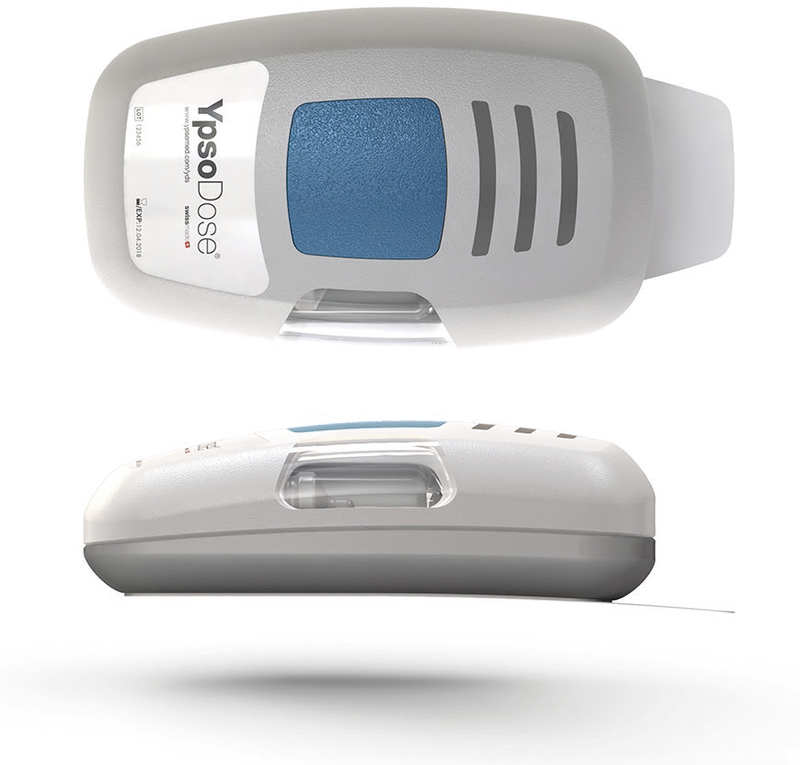 A good example of innovation in wound care has been negative pressure wound therapy. For many years, KCI had the market sewn up with a broad patent and was able to deliver real benefits to patients. But now, with the patent defences overcome by litigation, a whole slew of competitors have launched negative pressure products, with multiple products on show at Wounds UK. This competition has led to a tenfold decrease in daily revenues from this type of product. So, where are Wound Care companies are looking next for innovation? Improved usability is one hot topic, and is nicely exemplified by CircAid‘s compression stocking, which was acquired in 2012 by Medi. One issue faced by patients is the need to wear multiple layers of stockings, each providing a certain pressure. The sum of the pressures needs to add up to the right level, such as 45 mmHg for the prevention of leg ulcers. CircAid’s new product allows adjustable pressure to be set in a single layer, wrap-around stocking, so it is simpler for the patient to wear while at the same time providing flexibility to the healthcare professional. Another trend is that the value of new products is under scrutiny by healthcare providers. The NHS in England increasingly is seeking an evidence base in favour of adoption of new technologies. The new product must be shown not only to work, but also to be cost-effective when compared to the health economics of alternative treatment pathways. Health Technology Co-operatives have been set up to evaluate new technologies, and above all they are concerned to make sure that companies spend their time solving the right problems. The first wound care devices are going through the evaluation process now, and many of the exhibitors at Wounds UK are lining up to have their new products evaluated. This means that approval by the NHS increasingly should become a criterion that shapes innovation. While global healthcare systems have different systems, the underlying message is the same to all innovators: your product will only be profitable if it successfully meets recognised needs in a cost-effective way. As an innovator in Wound Care technology, Springboard has compiled a report of innovations from the show. It offers insight into where the trends lie and how companies are tackling innovation in 2014. Executives and managers at wound care companies are welcome to contact us to arrange a meeting to present the report, free of charge.